I’ve had a look on the CIWEM website to see if this interview is off the back of some recently published report, but it seems not. Googling identifies the interviewee as an independent Member of a CIWEM Yorkshire Regional Flood and Coastal Committee, who works for a leading firm of consulting engineers. It feels like a case of an engineer coming up with an overwhelming sensible, cheap and practical solution, but getting a bit frustrated that nothing happens, so talking to the BBC, with the endorsement of her professional body, in an attempt to get things moving – or in the case of rainwater, not moving quite so fast. EU bureaucracy and the high standards of proof required, quite properly, when tax payers’ money is involved? Incentives for farmers are one key sticking point. In theory, funds from the Common Agricultural Policy can be used for catchment management but in practice Ms Pygott says that the standard of proof is much higher than for biodiversity projects which can also be supported under the CAP. “With biodiversity schemes a farmer simply has to show that he has changed the land in a way that’s expected to benefit wildlife,” she adds. “With flood schemes they have to prove what the benefits will be and that’s very hard. CIWEM say the quickest results for back-to-nature drainage will come in areas where land is owned by a few people. For instance, near Pickering in Yorkshire, flood zones are being created and moorland drains stuffed with heather with the co-operation of just three large landowners including the Forestry Commission. 3. 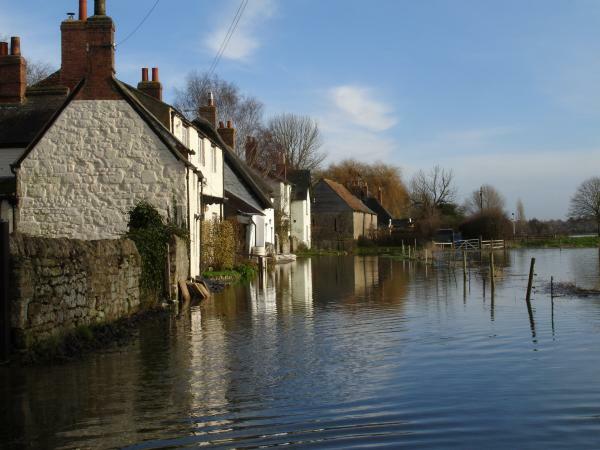 Property insurance should fairly account for flood risk and should reflect local measures taken to manage that risk. Indeed. That should be the starting point. Apart from anything else, insurance companies should be able to judge commercial costs and benefits, without painstakingly high standards of proof, and may be better at it, and more committed than overstretched government and EU officials operating in a climate of jobs being cut. The key here really is to not build on flood planes full stop. Although idyllic in terms of aesthetics the reality is waking up to a flooded and ruined ground floor space. Except that these cottages were built about 300 years ago, and in the last 50 years this is only the second time the flood water has come this high. The last time was in 2007. So while I agree that planning permission has been given too easily for houses to be built in flood plains, it’s not the only problem. As for solutions, engineering ones are just as worth looking as planning policy ones. Sadly we can’t undo what has been done, this is down to planners missing the obvious fact that if you build on a river bank then at some point you’re going to get flooded because without implementing any kind of defense management you will without any shadow of doubt get flooded. Town planners Gov and builders should be held accountable because the building of dwelling in locations which over the past 20 years have been affected by flooding should never have built in those locations and should be included in any remedial works to protect against it..The government are ultimately accountable because there hasn’t been any real considerations with the planning office, obviously we can’t do anything about what has been in place for centuries in terms of the buildings in historical towns etc. I don’t really know how the government will stump up the cash to resolve the miles of affected areas. So trying to hold government “ultimately accountable” isn’t going to achieve anything. But change the rules of the game so that insurance companies have an interest in solving it, and we can start to make progress. OK – someone has kindly pointed out to me – not in as many words – what the problem is. Government has stepped in with a proposal to set up a new mutual company, Flood Re, in principle to start operations in 2015, but it sounds as if deadlines are going to be missed. It will be responsible for administering a scheme whereby insurance premiums for houses vulnerable to flooding will be subsidised. Could there be a market solution, which just requires some thought to identify? For example, companies insuring houses at risk of flooding just use some of the premiums they get – and because the houses are high risk, the premiums are significant – to pay upland farmers and landowners to make the changes needed. That is all, although it will be done most efficiently by one insurer specialising in it, and reinsuring the relevant household risks of more retail focused insurance companies. Immediately they will be able to expect higher profits each year. Market forces aren’t always quite so simple. It doesn’t immediately bring down premiums for the poor householders concerned, but it will before too long, because some other specialist reinsurer will move in to the market, and offer better terms. But now it won’t happen that way, because the government has announced that it is going to go into the market instead, and throw a whole lot of tax payer funded subsidy at the problem, incurring the possibility of challenges from EU competition policies, and putting the onus of getting the practical solutions implemented on civil servants. Has anyone mentioned this yet from George Monbiot? I found it very interesting. And quite shocking/depressing. having followed up the George Monbiot link, and I’m a bit depressed by it too, because, as with all the other commentary on this, the possibility of market forces never so much as flickers across his mind. Perhaps I would do better not to point out that the obvious, no fuss way of dealing with the problem I describe, is an instance of letting market forces apply, because people have such bizarre reactions to the phrase. On the Left, they run a mile, and probably feel they have committed thought-crime. On the Right they go weak at the knees, and instead assume that regulations which in any way make markets less free are always a mistake.